According to Dan Hodges, writing in the Daily Telegraph, Ukip are preparing to offer Tory MPs a Faragian pact at the next election, with the smaller party reportedly ready to stand down candidates against those embracing its slightly eccentric brand of Eurosceptic nationalism. At the last general election Ukip did indeed not stand candidates in certain constituencies, a decision which caused a sizeable number in the party to become extremely unhappy bunnies. It may be that I exhibit the traits required in a politician by appearing a tad thick but, presuming that this “offer” is true, I fail to understand just what Farage hopes to gain. Just what is to stop any Conservative candidate making the sort of noise that pleases Farage, who then ‘stands-down’ his candidate, only for said Conservative candidate to turn round when elected and, in effect, stick his tongue out? A number of decisions that Farage has made in the past have been questionable and this latest is no different – mind you, for a party that totally ‘cocked-up’ its campaign during the London Mayoral election this year, this latest does but join what is quite a long list of what may, in polite circles, be called a Gaffarage. Ukip are only polling an average of 9% at the moment, meaning the party is approximately 20% short of attaining one or more MPs and if the Buckingham campaign is any yardstick Ukip could poll 30% and still not get a single MP. It may well be that I am totally wrong – but I would ask any of my readers: who among you is blessed with the ability to understand the logic of any decision made by a politician – because I am buggered if I can. Tory HQ has already confirmed that any Tory MP candidate accepting Farage's offer would be deselected and any association that endorsed it would be disbanded. And let us not forget that a large number of UKIPPERS also reject ANY proposed deal with the Tories. Witney also mentions the farce that was UKIP's London election campaign. LINK. You will recall that UKIP stood as Fresh Choice for London. The leadership assumed that that both the UKIP name and the Fresh Choice description would appear on the ballot papers. This was despite being warned by UKIPPERS in London that this assumption was incorrect. It was only when the first set of nominations were published that Farage and his not so useful idiots finally accepted that they were in the wrong. We should point out that a number of UKIPPERS still believe that Farage deliberately set out to damage the London campaign by re-branding UKIP as Fresh Choice. We don't share this view. Farage lacks the brains to be that Machiavellian! It is interesting to note that registration of Fresh Choice required the signatures of Nigel Farage, Peter Reeve and Stuart Wheeler. So the ultimate responsibility must lie with them. But let us not forget that the NEC endorsed Farage's decision to use the Fresh Choice tag. So have heads rolled over this farce? Not on your life. This is UKIP we're talking about! Incompetence, corruption and unprofessionalism are the norm when Nigel Farage leads you. 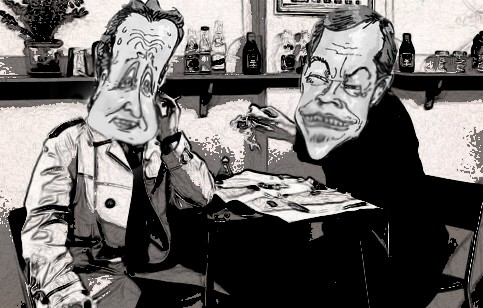 Nigel, you have been claiming for years that you are going to 'professionalise' UKIP. So how about starting the process by sacking yourself and those other chumps named above?